Janet Gertrude Gloria Blais (nee Laroque) was born on April 29, 1933 near Duck Lake, Saskatchewan, the third of five siblings. Raised in a simple rural home, she blossomed in school proving to be an intelligent student. After graduating from Stobart High School in 1951, she worked as a Study Supervisor for two years in the Shell River, Garthland, and Tulip, Saskatchewan school divisions. On November 13, 1953, she joined the Royal Canadian Air Force attaining the rank of Leading Aircraftwoman during her assignment in the clerk account office. 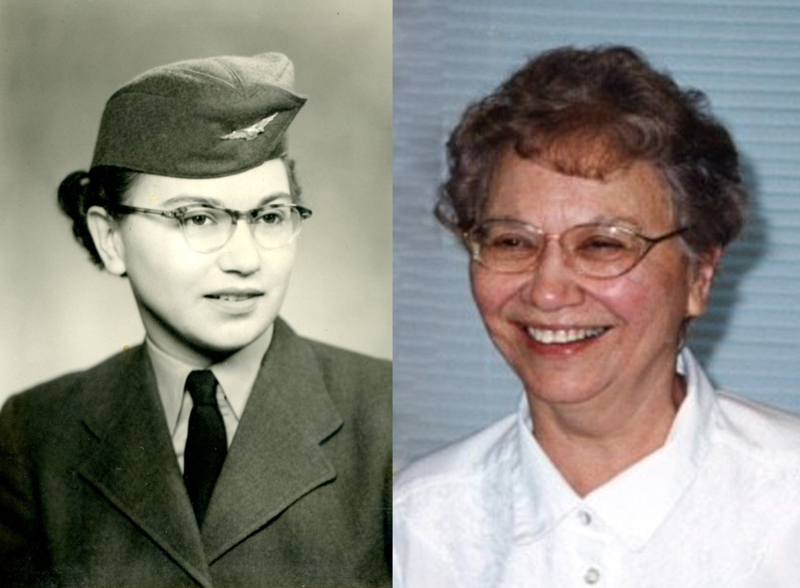 She greatly enjoyed her time in the Air Force, especially the opportunity to meet new people and travel throughout Europe during her 1954-1956 deployment with the No. 4 Fighter Wing in Bad-Soellingen, Germany. In December, 1956, Janet was posted back to a base in Claresholm, Alberta and there met her husband-to-be, Leading Airman Joseph Alphonse Gatin Blais. Their whirlwind courtship culminated in their 1958 marriage and what was to be a life-long romance eventually producing two sons and a daughter. Taking up her role as wife and mother in those days required Janet to resign from the Air Force and she was honourably discharged on July 16, 1958. Mom was a careful manager of the household even through the transfers to Portage la Prairie, Saskatoon, and Edmonton required by Alphonse’s 18 year Air Force career. While money was never plentiful, mom was always able to ensure lots of good food to eat, nice clothing to wear, and the ability to participate in recreational activities. It was during their time in Edmonton that mom decided to return to school and enrolled in the Faculty of Education at the University of Alberta. Following a number of years of summer school and night classes, mom received her Professional Certificate in Education. In 1968, she began her teaching career with the Edmonton Separate School Board where she taught for four years. In 1972, Janet and Alphonse decided that he should take advantage of an early retirement from the Air Force and move back to their favourite city of Saskatoon. Mom was quickly hired as a French teacher with the Saskatoon Separate School system where she taught until her retirement in 1989. During her teaching career, she was always known for being a well prepared, pleasant, enthusiastic, and effective teacher. Janet was respected and loved by her colleagues, her students, and those fortunate enough to intern teach under her guidance. Until her health started to decline, Mom very much enjoyed her retired years. She and dad were active members of the Legion and the St. George Seniors Club. They enjoyed bowling in a variety of leagues, going to dances, visiting with the many friends that they made over the years, and traveling. They were devoted grandparents and enjoyed traveling to visit their far-flung grandchildren. Mom was always very supportive of her children and grandchildren. She was intelligent, kind-hearted, and always ready to assist when called upon. Her grandchildren will always remember time spent at her house and during her visits as well as her thoughtfulness on birthdays and Christmases. Sadly, mom’s health took a downturn a few years after dad passed away. Despite her health challenges, mom continued to enjoy life. Even when her situation made it necessary to move to the Saskatoon Convalescent Home, mom tried her best to make new friends and enjoy her visitors. Sadly, her long, happy life ended on October 29th, 2018. Janet is survived by her three children, Darrell (Rosaline), Rocklin, and Nicole, seven grandchildren, and nine great-grandchildren as well as her sister, Noella Schreiber (Emil). The family thanks the staff of the Saskatoon Convalescent Home and her friends at Home Instead for making Janet’s last few years as comfortable as possible. In a small ceremony for close friends and family, our mother will be interred in the Military section (Block 58A-58-N1/2) of the Woodlawn Cemetery, Saskatoon at 1:00 p.m. on Thursday, November 1, 2018. Please meet at the gate at 12:45 p.m. Arrangements in care of Chelsea Krentz – Mourning Glory Funeral Services (306) 978-5200.